We provide Paper Converting Machines which includes Note Book Making Machines. Exercise Note Book Finishing Machine is specially developed to meet the needs of customers who have ruling machine and need finishing machine to make exercise note book . 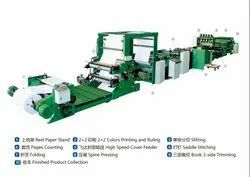 It is mainly consisted of six processes : flat stitiching , folding , pressing , cross-cutting , slitting and the finished products of notebooks . It is of simple operation and cost effective , requiring small investment , which especially fits small customers. Take it easy, accurate color, long life. Use motors, variable frequency speed control, saving electricity, small running fluctuations. Use special diagonal-tooth gear, accurate printing size. Printing rolls treated by dynamic balance, static balanced. Print produce are clear and good arrangement quality. Configuration: Japan Brand NSK Bearing, Germany Hohner Stitching head, Germany IKS Shanghai Knife, Switzerland Habasit Feeding Straps etc. We offer Automatic Exercise Notebook Machine runs on PLC control system with touch screen operation and diagnostic fault indication. Water based flexo printing ink is non-polluting environmentally-friendly material. 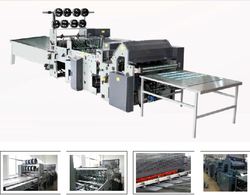 This production line is an ideal for mass production of wire stapled notebooks. Diagonal-tooth gear for accurate printing. All Printing rolls are dynamic and static balanced. Print produce are of high quality.